Stampin' Up! Demonstrator Kim Price - Handmade by Kim: Pinkies Stampin' Up! 2016 Spring / Summer Catalogue Blog Hop! Pinkies Stampin' Up! 2016 Spring / Summer Catalogue Blog Hop! buttons at the end of each post to keep hopping! If you have arrived here from Sarah's blog, thanks for stopping by! Isn't Sarah's card so cute! I really hope you enjoy looking at the projects we have made! Today's project is a stationery tin and set of notebooks I've made using the new Birthday Bouquet Designer Series Paper. Isn't it just gorgeous? I made two sets as Christmas presents - one using Blushing Bride cardstock and the other using Pool Party cardstock. Both of these colours match this paper perfectly. The Birthday Bouquet Designer Series Paper pack contains 12 sheets of 12" by 12" cardstock and each piece has a design on both sides (6 designs in total). The 6 different designed papers contain one or more of the following colours: Blushing Bride, Mint Macaron, Mossy Meadow, Old Olive, Pool Party, Soft Suede, Watermelon Wonder and Whisper White. I think you could quite easily use Old Olive or Watermelon Wonder cardstock alongside this paper, or even Mint Macaron. If you've been following my blog, you may have seen me using this tin before in my Typeset Specialty Series. 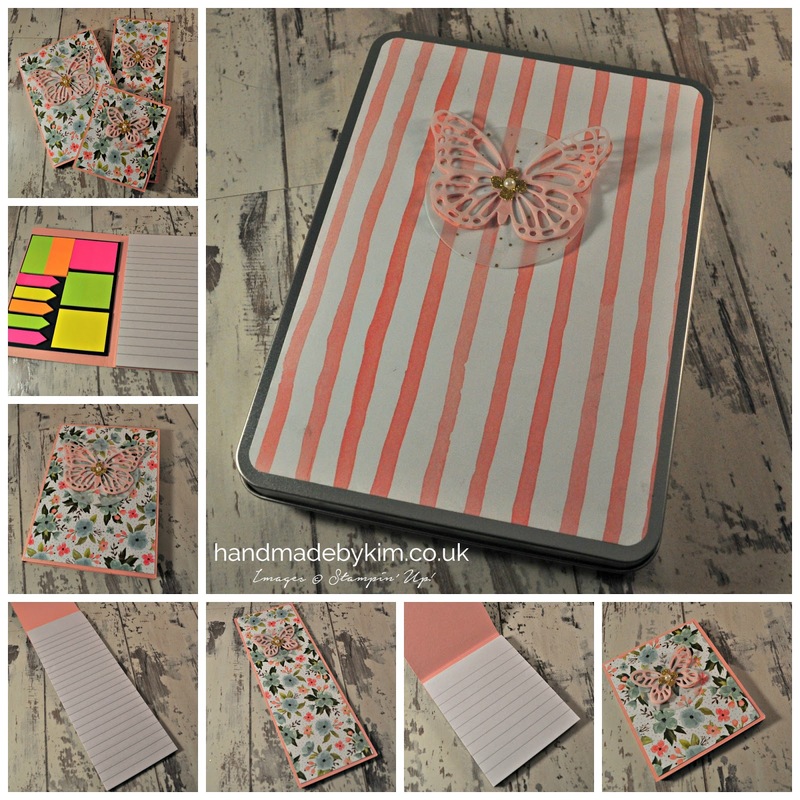 Its a great tin for this sort of project as it can fit a number of items inside - this stationery set includes a shopping list, notepad (including post it notes), a mini notebook and a gold sparkly glitter nail file. 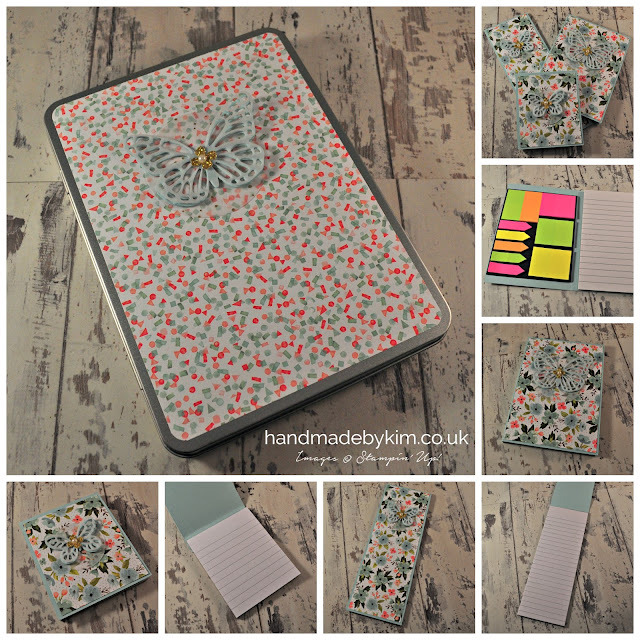 I've used my all-time favourite centre piece for the front of the tin and notepads which consists of a die cut butterfly from cardstock and vellum. 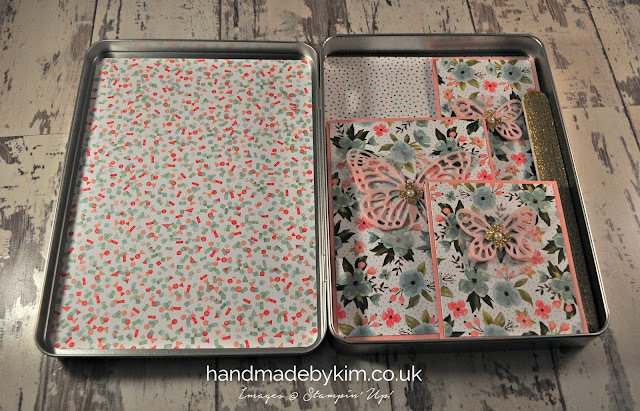 I've used the medium sized die from the Butterflies Thinlits Dies for the front of the tin and the notebook and the small butterfly die from the Bold Butterfly Framelits Dies for the shopping list and mini notebook. I LOVE these dies, which is why you will find them in lots of my projects! The new Big Shot Die Brush on page 19 of the catalogue is perfect for popping out all of the little pieces from the butterflies! Its my new best friend. I hope you enjoyed looking at my project today - make sure you leave a comment to let me know you stopped by! Next up is Tracy and she has made a fabulous card for you today. Enjoying hopping and I hope to see you again next time. Lovely set! That paper is so lovely! Your stationary set is so special! Thanks for sharing! Thanks Michelle, its my favourite too. I can't stop using it! I LOVE this paper Kim, great choice for the hope. Your tin set is really beautiful. Beautiful colours, a lovely gift set. Aren't they... spring is coming! Won't be long now! Love your Project. Please do a video on how you created it. Thank you for sharing your talents. 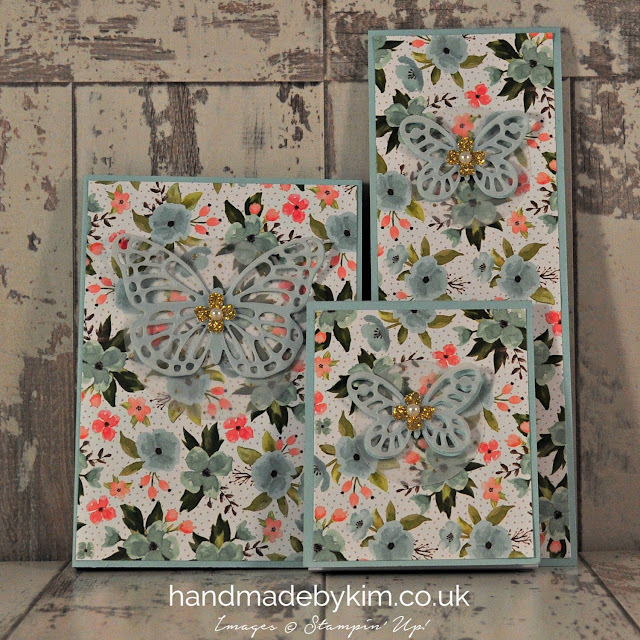 Love your stationary sets Kim! I love stationary sets. Yours is great.